While attempting to run a Windows Update you see the following error. Code 80072EFD Windows Update encountered an unknown error. Get help with this error. Note: There seems to be a few causes of this error, but in my case it was the proxy server. 1. 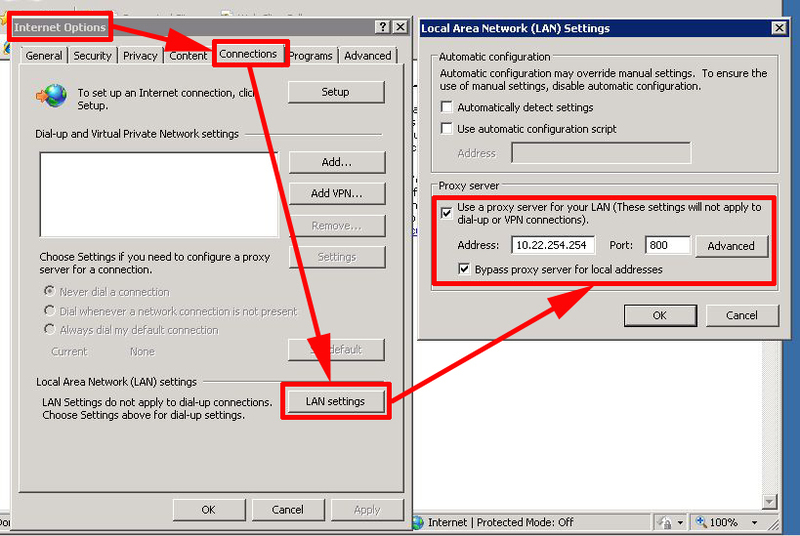 Assuming you have a proxy set in your web browser settings (Internet Options > Connections > LAN Settings > Set proxy settings accordingly). Note: Your proxy may be using a different port to the one shown. 3. If this machine with the update problem has access to the internet (without going through the proxy) you can simply add these addresses as “Exeptions” by pressing the advanced button above. 4. If the proxy is the only machine with internet acess and you cannot do that, then you need to allow access in the settings on your proxy server. 5. Once done, updates should resume.